We had a wonderful weekend – lots of swimming, playtime and SUN. A little too much sun as it turns out. Sunscreen application is required here in our house, but re-application after horsing around in the pool for a bit sometimes slips our collective minds. As a mom, I have experienced all sorts of health-related issues with my three – upset tummies, headaches, grumbly bums. I keep a supply of drops, pills, creams and BandAids on hand for pretty much anytthing. Well, anything except a sunburn it turns out. I had nothing in my cupboard for relief from the stinging tightness on their backs. I applied cool cloths and some moisturizing cream last night, but the kids were complaining after school and apparently were so sore, they couldn’t possibly carry their backpacks home! Insert exaggerated eye-roll here. According to my good friend, if I don’t have an aloe vera plant (which I don’t because I KILL everything) I am supposed to apply vinegar. Yes, vinegar. 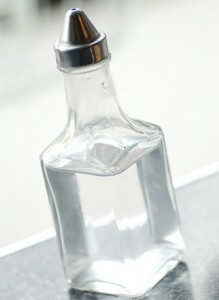 Now, you more experienced moms may be shaking your heads at me, thinking, well of course you apply vinegar to a sunburn. I, on the other hand, could only envision my son emitting loud screams of pain as I rubbed it on his poor, raw, pink skin. Alas, I was wrong. A quick search and voila – it’s true. Some believe vinegar has antiseptic properties, some think it takes away heat from the skin, others think this is an old wive’s tale. One slightly relieved boy (whose smell is now making me crave french fries), and one relieved mom, who now has a secret weapon in her arsenal against yet another childhood woe. So, now I’m thinking about other products I have in my pantry that could help me out in a pinch – not to mention keep chemical concoctions away from my kids….Suggestions, anyone?? So yesterday was Meatless Monday – a little experiment for our family. We don’t consume a lot of meat and have experimented with vegetarianism too. To be truthful, after an extremely busy hockey-soccer-birthday party-hockey-soccer weekend, I was too pooped to shop and wanted to use up some stuff in my fridge. 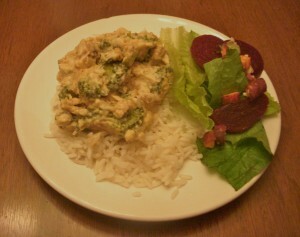 As such, dinner became a curried chickpea over rice concoction. I have made this many times so I know my kids will eat it. They ate it so quick yesterday, I didn’t even have time to snap a picture I have chosen to stop buying canned goods recently due to concerns about BPA and the environment and cost, so a quick boil and simmer of dried beans was in order. Being inexperienced with this – I actually didn’t think about the quantity I would need for dinner – I poured a bunch in the pot and had about 2 cups left over. Now, I have to pause here, and confess that I have little ok, big potato chip addiction. Not just the once-a-month, need some salt kind. The where-did-I-put-the-chips-it’s-quiet time-and-I-want-my-snack kind of craving that hits me usually as soon as the kids go to bed! I really don’t need to eat chips (who does really?) but I enjoy the crunch and the saltiness ALOT. 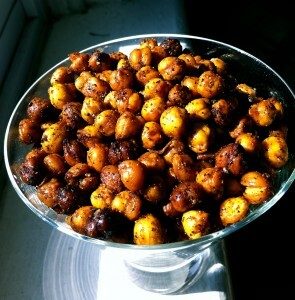 I recalled seeing a tweet from one of the local bloggers I follow (see her juggle over here ) about roasted chickpeas and thought – PERFECT! Score one for me for using up the extras instead of tossing them, AND I get a healthy snack to boot. Unfortunately, I didn’t think of checking her site for the recipe and found another at a fave site of mine. So, here’s the recipe I used. Whisk together spices and oil, then coat the chickpeas thoroughly. Spread on a foil-lined baking sheet and roast at 375F for about 45 minutes. I shook them around a few times, just to make sure they cooked evenly. Well, it happened. Three kids in hockey, and we spent our first weekend truly shuffling from one arena to the next, stinky gear and all. I knew this would happen. 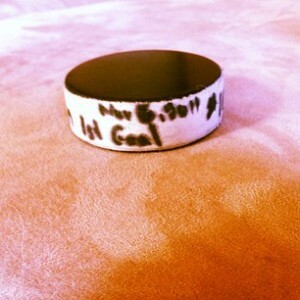 People are often surprised when I tell them all 3 darlings are playing hockey this year. “Wow, you must be crazy!” is a familiar comment. Well, ya, I am, but not because I have 3 kids in hockey. What I have is 3 kids in SPORTS! Pick any sport and you will find yourself running from practice, to a game, to another practice all the while thinking about the myriad of other, more interesting things you could be doing. I have 3 children. They are involved. They are getting regular exercise. They are learning what it means to work as a team. They are figuring out how to challenge themselves, to do their best and sometimes, (more for one than the others) to accept defeat. These are important life lessons that hopefully will contribute to their overall development into caring, sharing adults. But enough about that. The most important thing on my mind as we began this weekend of ‘arena shuffle’ was WHAT THE HECK ARE WE GOING TO EAT WHEN WE GET HOME? Ottawa arenas are sorely lacking in healthy, tasty foods with which to properly nourish young bodies (and this old one too). Fries, Slushies and Salt & Vinegar chips can only take you so far. So, I pack snacks. Fruit, muffins and the occasional power bar. These are fine for on the go, but we needed to eat a proper dinner at some point. Arriving home at 6pm on a Saturday with tired, hungry kids (not to mention us poor parents) is not the time to think about WFD. So, I took a little time Saturday morning (prior to game 1 of 3!) and whipped up this yummy, fortifying dish of goodness. During a break, where I ran home to take our poor neglected pooch for a quick spin around the block, I popped it into the oven, set the timer and headed back out to watch my oldest attempt to score his 3rd goal of the season. It’s easy, it pleases everyone, and, best of all, it was hot and ready when we arrived home. While various children showered and put away their gear for the night, I threw a salad together. We sat down and reviewed the day’s events – 2 winning games & “Hardest Worker” award for one boy, a hard-fought but losing battle for the oldest, a fun practice for the girl and cold feet and bad coffee for Mom & Dad. Not a bad day really. Best of all, we shared some laughs, cheered each other on, and did it all as a family. In fact, I can’t think of how I would rather spend a weekend – can you? ***Special Thanks to my good friend, Karen, for the recipe!! 1 big handful of spaghetti noodles, broken. Grated cheddar cheese, about 2 cups. Cook the spaghetti, careful not to overcook it. In a Dutch oven, brown the meat and drain the fat. Add the veggies, a splash or two of the Worcestershire sauce, salt & pepper to taste. When onions are soft, add the kidney beans and tomato soup. Mix well, then add the cooked spaghetti. Put all of this in a 9 x 13 casserole dish, sprinkle cheese on top. Cover loosely with foil and you are READY TO GO! Pop in a 350F oven for 35-40 minutes and ENJOY! Sign of things to come in my house, I tell ya. So fast forward to 5pm. I have helped with homework, stood over kids unloading the dishwasher (don’t get me started on the complaints there), done 2 loads of laundry, made my oldest walk the dog and suddenly, it’s time to get some food on the table. Yesterday, I made some yummy grilled, spice-rubbed chicken breast. I served them over rice for the menfolk in the house while my daughter & I went out to eat. I had four left over and figured I could do something interesting with them. The day was gloomy here, threatening skies, a little cool – a comfort-food kind of day. NOBODY WAS GOING TO EAT THIS. I have one who won’t touch broccoli, one who gags at creamy things, another who is pretty well only eating when the wind is right and the last who is (ahem) watching his cholesterol. Since I believe that a happy mom makes for a happy house, I thought, What the heck? I’m making this anyway because it’s what I want. I did turn to my trusty friend, the Internet, for a quick recipe. I had a general idea, but rightly guessed that a little guidance was in order. So, thank you, Paula Deen for the recipe. This beautiful Southern woman knows her casseroles. However, I nearly choked when I saw amount of sour cream, mayo and cheese she uses. I quickly thought about my husband (and his cholesterol count) and decided that I needed to shape this up a bit if it was going to suit my family. Halved the amount of chicken, and cut into cubes instead of shredding. Used a quarter of the sour cream (no fat) and mayo (Olive oil based). I only used 1 can of soup (because I didn’t read the list thoroughly!) I didn’t have it on hand, but next time I would used reduced-fat cream of mushroom soup. I did not add any extra salt, figuring that the soup would have plenty. Also, the chicken was nicely spiced, so no extra flavour was required. Oh, and because I drank it all the night before, I left out the wine! Last, I used crushed whole wheat crackers instead of buttered bread crumbs for the topping. So how did it all turn out? Well… IT WAS AWESOME! The kids, despite their initial resistance, ate, and one asked for more. The broccoli-hater pushed her evil green bits to the side without complaint. My reflux-boy had no problems and the fair-weather eater? Well, a little more prodding was required (i.e. raw broccoli traded for cooked) but he ate too. She confessed that she was using a recipe that she got from here. (I love when people share a recipe with you instead of coming off all chef-like and superior!) So into the grocery store we went. I love Asian cuisine, as does the rest of my brood. Anything with noodles to slurp is generally a hit around this house. We also have varying meat/veggie preferences here, so serving a big bowl of dressed noodles, with toppings on the side, a la family-style is also a big hit. I had eaten but never cooked soba noodles (known as buckwheat noodles for the uninitiated), so I was a bit apprehensive. She cautioned about overcooking them and stressed the need for cold water and proper draining to ensure they did not become sticky. Since this is a dish best served chilled (or at least room temperature), over-cooking the noodles is a no-no. I had some steak to grill and a quick marinade of soya sauce, sesame oil and garlic seasoned it perfectly. 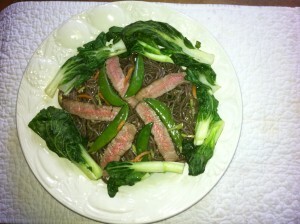 Seared, thinly sliced beef, baby bok choy, julienned carrots and sugar snap peas rounded this dish out nicely. We are trying to curb salt in this house, so I did not add it to the water for the noodles. Also, since the beef was marinaded in soya sauce, I reduced it to about 3 tsps in the dressing. The verdict? Some liked it, others did not. A house rule of 3 tries convinced two of them that it was worth the effort. One detractor went to bed a little hungry, but that’s another post altogether! The lentil soup recipe was requested by my brother-in-law who wants to cut down on his sodium intake. And, really, most of us consume WAY TOO MUCH as it is, so we can all benefit from a little less now and again. Omitting meats, salted butter, canned lentils and using sodium-reduced stock go a long way to keeping a lid on the salt in this delicious soup. Stock can be made at home too. 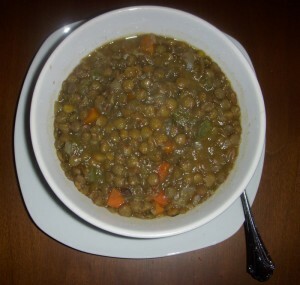 The lentil soup has a beefed-up taste, but is 100% vegetarian. In a large saucepan, saute onions, carrots and celery in oil until softened, 5 minutes. Crush and add garlic. Add thyme, bay leaf, sage, and pepper. Rinse and add lentils. Pour in stock and blend thoroughly. Bring to a boil. Reduce heat to medium-low. Cover and simmer for 15 minutes. Add 1 cup of hot water, simmer again for 20 minutes. **Add another cup to thin out soup, or keep it thick like a stew. Serve with salad and whole wheat bun. Since he likes his food spicy – I add dried chili pepper flakes and fresh ground pepper with the herbs. Kicks things up a notch and he doesn’t even miss the salt! Well, what do you know? My carnivorous, steak-loving, bacon eating 9yr old has decided that she will become a vegetarian! Now what do I do??? I think that this may be a phase and I love my kid, so I am indulging this request for now. I have spoken to her doctor who gave us the okay and have set out to find delicious, nutritious meat-free recipes and meal ideas. I have a pretty good repertoire of quick, easy meals that I can make that most of the family will eat – but, guess what? They all contain some form of animal protein. I have three kids who are growing and constantly hungry. I worried that a non-animal protein diet would not be satisfying enough and that they would be eating ALOT of peanut butter and eggs to make up for it. Fortunately, fish was still on the menu – apparently not a ‘meat’ according to my girl. And, since everyone liked virtually any kind of seafood, I was in luck. Don’t get me started on the fears and concerns about sustainable seafood and mercury…I try not to think about it! When her father went off meat and dairy for dietary and health reasons, I largely ignored him when considering WFD. I made sure to buy him things that he could eat; veggie cheese, veggie dogs and veggie anything else they make. I would make our dinner, then he would come home and fend for himself. I have three kids, a dog and I AM BUSY DAMN IT! It’s hard enough to consider the various food preferences and “I don’t like’s” of the kids, let alone whip up healthy vegetarian meals for a 40 yr old man who can now eat NOTHING! So now that one of my darlings has jumped on the bandwagon, I figure we may as well all hop on. I make a concerted effort (my husband may disagree somewhat) to put at least one meal on the table each night that satisfies everyone. I have reached out to vegetarian friends and family, spoken to chefs (okay, well just the one that I know) and been all over the internet in search of yummy meals that fit our current non-meat-eating status. I came across a really good overview on YouTube counting down Nutrition by Natalie’s Top 10 Worst Food. There shouldn’t be any surprises. However, I think we all need a good reminder once in a while. Also, if you are feeling rundown, depressed, and overall, lacking drive, Natalie may be right. Maybe it’s the food that you are eating – not mention the future health problems you might develop. That said, I was a little surprised to see catfish. I hope you find the video as informative as I did. Kell's Kitchen leverages the Twitter community by showcasing tweeted recipes, foodie jobs, and food related reviews. Also, I'll do my best to reproduce recipes and blog about my experiences.